At University, in 1995, my hearing was at an all-time low. I'd crank up the CD player volume, put on my headphones and listen to the Oasis album, 'What's the Story Morning Glory.' I loved this album. The songs of Champagne Supernova and Wonderwall were magical. I felt respite and comfort in my world of music. The future scared me then. What if I could not hear music again? There would be a big void in my life. Five years later, at the age of 30, I had my Cochlear Implant operation. From there, I was determined to work on listening to music again. I remember a conversation with my brother in 2016. He was experiencing a downward spiral of progressive hearing loss. He was considering a Cochlear Implant operation. His main concern was whether music would sound the same again with a Cochlear Implant. I struggled to answer his question. Every situation is different. How could I reassure him? In 2017, I attempted to answer the question, 'What does music sound like with a Cochlear Implant? ', to a wider audience. I also wanted to share the tips that I use when listening to music. All this information can be found at the blog posting: My top 12 tips on listening to music with a Cochlear Implant. But, I didn't want to stop there. I wanted to delve further. I wanted to hear people's experiences of music with a Cochlear Implant. I wanted to share this information with the world. So, I asked you: Tell us your favourite song when listening to music with a Cochlear Implant and why you have chosen this song. In reaching out to all of you, I am overwhelmed by the response. Many of your stories have blown me away. I have to admit, I shed a few tears. I didn't envisage that I would feel emotional. Your stories about music are very precious. I am privileged and grateful that I can publish them today. I hope you enjoy these stories as much as I have. Originally I aimed to have a top 25 list. But, I didn't want to omit any of your stories. So, 25 has become 36! At 67 years old, this song has always been my favorite. I could follow and sing along with either Paul Simon or Art Garfunkel. Now, five years into Bilateral Cochlear Implants, I can still follow both singers. A new rendition of the song by the group Disturbed initially "disturbed" me! But, as I listened to it more, I began to enjoy the "intensity" of the singer's voice. Not to mention, this song can also be the theme for Cochlear Implants. Please click this link to the Amazon US website to download the Sound of Silence by Simon and Garfunkel. Please click this link to the Amazon UK website to download the Sound of Silence by Simon and Garfunkel. Please click this link to the Amazon US website to download the Sound of Silence by Disturbed. Please click this link to the Amazon UK website to download the Sound of Silence by Disturbed. It was the very first song I heard after my switch on. When Adele sang the coincidental words, "Can you hear me?' I screamed and shouted, "Yes I can hear you!!" The feeling inside was amazing! Before the implant, my hearing was getting worse. The regular visits to the Audiologist become a chore. I would ask them to make my hearing aid settings louder. I would go home and listen to this song in the hope that I would hear it like the way I remembered it. But, alas, it did not sound the same. Adele's concert was the last I attended before going profoundly deaf. Since having my Cochlear Implant, I love listening to this song again as it gives me the best fuzzy feeling in my tummy! Please click this link to the Amazon US website to download Hello by Adele. Please click this link to the Amazon UK website to download Hello by Adele. My reason for choosing this song is simple! I just love the different pitches of their voices. Please click this link to the Amazon US website to download December, 63 (Oh What a Night) by Frankie Valli and the Four Seasons. Please click this link to the Amazon UK website to download December, 63 (Oh What a Night) by Frankie Valli and the Four Seasons. There is no other song in this world that will get me fired up and ready for a race or training than this song. From the beginning trumpet to the chorus, this song has it all for me. One can't listen to this song and not feel inspired! Please click this link to the Amazon US website to download Gonna Fly Now by Bill Conti. Please click this link to the Amazon UK website to download Gonna Fly Now by Bill Conti. I love this song, it's easy to hear, I can hear it very well. It is easy to follow the words when watching the lyric video. Neil Sedaka's songs are easy to recognise and sing. Please click this link to the Amazon US website to download Laughter in the Rain by Neil Sedaka. Please click this link to the Amazon UK website to download Laughter in the Rain by Neil Sedaka. When I streamed music for the first time with my Bilateral Advanced Bionic Naida, this was the song that came on. It was the first time in my life that I experienced stereo sound! My head was swivelling back and forth, to the beat, and I was dancing with joy. It amazed me at how good it sounded! It's still a favourite song of mine although now I listen to everything! Please click this link to the Amazon US website to download Bohemian Rhapsody by Queen. Please click this link to the Amazon UK website to download Bohemian Rhapsody by Queen. Before my Cochlear Implant, I never heard the bird chirping in this song! Please click this link to the Amazon US website to download Blackbird by Paul McCartney. Please click this link to the Amazon UK website to download Blackbird by Paul McCartney. This song has a very soft sounding 30 seconds introduction which is outstanding. At first, after my Cochlear Implant operation, it was impossible to hear. But, the time to hearing this elusive introduction was on the horizon. With my Cochlear Nucleus 7 and Bluetooth for Apple iPhone, I hear this song better than when I first heard it in 1971. My hearing then was at its peak and undamaged. Today, it is a true miracle that I can enjoy the introduction to this song again. Please click this link to the Amazon US website to download Stairway to Heaven by Led Zeppelin. Please click this link to the Amazon UK website to download Stairway to Heaven by Led Zeppelin. A song released since I had my Cochlear Implant. It just resonates with big bass and a fantastic dance vibe. Brilliant! Please click this link to the Amazon US website to download It’s a Beautiful Wold by Noel Gallagher’s High Flying Birds. Please click this link to the Amazon UK website to download It’s a Beautiful World by Noel Gallagher’s High Flying Birds. This is the song that inspired me to listen to music. It was at High School, 5 years after implantation. Our English teacher played this song for the class. He gave us papers with lyrics with left out words. We were then asked to fill in the blanks. Due to the nature of my hearing loss, I couldn't do this, so I copied my classmate's answers! But, I remember thinking at the time that I liked the lyrics and the song also sounded magical. From then onwards I started to listen to music. I have a few more favourite songs but this one has its own special place in my heart forever. It was also the first song I wanted to hear with both ears after I got my second Cochlear Implant recently. Please click this link to the Amazon US website to download Wish You Were Here by Pink Floyd. Please click this link to the Amazon UK website to download Wish You Were Here by Pink Floyd. When I had my Cochlear Implant operation after years of being deaf, I began watching VH1 music channel. This helped me in practicing my listening with the Cochlear Implant. I fell in love with the "Songs About Jane" album by Maroon 5. One morning, I was in the kitchen washing dishes and listening to music. My husband came up behind me, took my hand and we danced in the kitchen. For so many years I couldn't hear well enough to feel comfortable enough to dance with him. It was like a dream come true. Now, we always dance together when that song comes on. Please click this link to the Amazon US website to download Sunday Morning by Maroon 5. Please click this link to the Amazon UK website to download Sunday Morning by Maroon 5. Songs I am familiar sound best through my Cochlear Implant. Almost any song from the 70s sounds good to me. "Beautiful" has rich piano tones with uplifting lyrics. The song brings me up when feeling down. I can't feel sad after I hear the first two chords. I doubt anyone could stay in bed after hearing the happy tones, "You've got to get up every morning with a smile on your face and show all the love in your heart." There is a constant beat to the song which is uplifting. The lyrics have crescendo and decrescendo tones. Please click this link to the Amazon US website to download Beautiful by Carole King. Please click this link to the Amazon UK website to download Beautiful by Carole King. This is the first song I heard through my Cochlear Implant that didn't make me feel like I was missing the entire song! I'm a 30-year-old man, and I wept for the entire 4:13 of the song. The vocoded vocals sound natural through my Cochlear Implant. The minimal styled composition and instrumentation didn't overwhelm my electrodes. I could even hear the vocal harmonies! I love this song! Recently, one of the members of Daft Punk, a band that has alluded to robots, has experienced the onset of progressive hearing loss. They have since stopped touring live. I often wonder if his experiences are expressed through this song. Please click this link to the Amazon US website to download Doin’ it Right by Daft Punk. Please click this link to the Amazon UK website to download Doin’ it Right by Daft Punk. I was a teenager in the '60s (and yes even though I was there I remember some of those years!) Listening to the Beatles music was the last time I could hear properly. I then lost my hearing due to Otosclerosis. In 1998 I received a short array multichannel CI in one ear and, to be honest, my music expectations were not great. But, one afternoon I was working in my office and my son was playing music CDs in his bedroom next door. He suddenly burst in on me and said 'Mum, you are singing along with the Beatles and with the correct words!' It was a revelation and I still well up when thinking about it. I wasn't even aware that I was hearing the song let alone that I was singing along with it. Wow! Please click this link to the Amazon US website to download Norwegian Wood by the Beatles. Please click this link to the Amazon UK website to download Norwegian Wood by the Beatles. I've chosen this song as I'd describe it as 'mellow'. As a lifelong deaf man, I find that I do best with melodious music, including classical music. Please click this link to the Amazon US website to download Unchained Melody by the Righteous Brothers. Please click this link to the Amazon UK website to download Unchained Melody by the Righteous Brothers. The music is different. It appeals to the way my Cochlear Implants sound. No lyrics, but pure music. Such a calming song with a lovely flow. Please click this link to the Amazon US website to download The Winner Is by Devotchka. Please click this link to the Amazon UK website to download The Winner Is by Devotchka. I went deaf due to medication from being in a coma for 5 months (ex-forces.) I lost my hearing in two days. This was the last song that I heard. After my Cochlear Implant operation, this was the first song I heard. 18 years deafness then miracles happen! Please click this link to the Amazon US website to download My Way by Elvis Presley. Please click this link to the Amazon UK website to download My Way by Elvis Presley. This was the song played. It was the first time, in 20 years, that I was able to hear music on the radio. Please click this link to the Amazon US website to download Does Your Mother Know by Abba. Please click this link to the Amazon UK website to download Does Your Mother Know by Abba. I love 80s songs in general. Learning to listen to music again with Cochlear Implants, I found that music from the 80s was easy to listen to. There were fewer instruments but those that I hear sounded very distinctive. In this song, the trumpet sounds strong and clear. Only two vocals make it easy to listen to as well and I can hear when they are both singing together. It is a wonderful song that reminds me of my childhood days. Please click this link to the Amazon US website to download Waiting for a Star to Fall by Boy Meets Girl. Please click this link to the Amazon UK website to download Waiting for a Star to Fall by Boy Meets Girl. I grew up with this song as my Dad shared his love for Canadian for music with me. I remember hearing the sleigh bells as a kid but over time as my hearing declined I no longer could. I knew the song so well my brain would fill in the missing bells but I knew I wasn't really hearing them. Once I got my Cochlear Implant, it has been remarkable to hear those bells again. As a simple song with vocal and guitar, it makes a great song for new Cochlear Implant users to start with. Please click this link to the Amazon US website to download Song for a Winter’s Night by Gordon Lightfoot. Please click this link to the Amazon UK website to download Song for a Winter’s Night by Gordon Lightfoot. An absolute classic! A song that was my favourite before my deafness. I now have my Cochlear Implant and this was the first song I chose to listen to after switch-on. Please click this link to the Amazon US website to download What’s Going On by Marvin Gaye. Please click this link to the Amazon UK website to download What’s Going On by Marvin Gaye. This song is my benchmark for music. Loved this song as a hearing teenager. Loved this song with my first hearing aids. This was the song I streamed first from my iPad to my Cochlear Nucleus 6. The song begins at a soft level. I heard that. As it gets louder, the bass joins and there is stereo. I still well up in tears when I remember that brilliant moment. It makes me teary with happiness now as I type this. In December 2016, I went to a Cat Stevens live concert in Sydney. Cat played this song. I wanted him and the whole world to know what an incredible moment that was for me sitting there with other fans. It was all I could do not to leap out of my seat with thankfulness to this technology. I am having Bilateral Cochlear Implantation soon. It will be Moonshadow that I will listen to first - of all possible music choices. Incredibly, in my life, I am able to function as a musician still. Moonshadow does it for me. Please click this link to the Amazon US website to download Moonshadow by Cat Stevens. Please click this link to the Amazon UK website to download Moonshadow by Cat Stevens. It was the first song I heard with my Cochlear Implant. Its a happy tune with nice simple lyrics. The singers have beautiful clear voices. It's a real feelgood song which makes for a wonderful first time hearing experience. The song appeals to all audiences from children to adults. So, take a few moments to sit back. Relax, listen, "and the bare necessities of life will come to you, they'll come to you, doo da do, doo da do." Please click this link to the Amazon US website to download The Bare Necessities by Phil Harris and Bruce Reitherman. Please click this link to the Amazon UK website to download The Bare Necessities by Phil Harris and Bruce Reitherman. This song takes me back to my youth, makes me want to dance and is one of my favourites to work out to in the gym. Ticks all the boxes for me. Please click this link to the Amazon US website to download Moving on Up by M People. Please click this link to the Amazon UK website to download Moving on Up by M People. Skies are blue for me now. Especially when the "pretty little bluebirds sing." It is incredible and wonderful to be able to hear them. Please click this link to the Amazon US website to download Somewhere Over the Rainbow by Judy Garland. Please click this link to the Amazon UK website to download Somewhere Over the Rainbow by Judy Garland. I love so many songs from so many genres but this song is no doubt one that I enjoy listening to. My theory is that songs with a broad sound range make a song more enjoyable for Cochlear Implant Users. We don’t hear all the sounds that the natural world hears. This song definitely has a wide range of pitches. Please click this link to the Amazon US website to download Adore by Amy Shark. Please click this link to the Amazon UK website to download Adore by Amy Shark. I love the songs of Will Young. I was able to hear music for the first time when he sang Evergreen on U.K. Pop Idol in 2002. Since then he opened that world of music for me. I've chosen "Joy" because the lyrics in the song can relate to my feelings when I listen to music. Please click this link to the Amazon UK website to download Joy by Will Young. There are many high-frequency words that are thrilling to hear now. For example, 'shine', 'shone', 'sun'. The instrumentals are fantastic to hear. I can enjoy all the lows with my Electric Acoustic Stimulation (EAS.) All the highs with my Cochlear Implant. It’s a great song, to start your listening journey with. Please click this link to the Amazon US website to download the album Wish You Were Here (remastered) by Pink Floyd which contains the song Shine on You Crazy Diamond. Please click this link to the Amazon UK website to download the album Wish You Were Here (remastered) by Pink Floyd which contains the song Shine on You Crazy Diamond. I've loved the Rolling Stones album Flowers since it came out. Lately, I've been listening to it again. I still have to know what's playing, in advance, to identify the song from the onset. But, 'Ruby Tuesday' is one of the few songs that still sounds pretty much as it did before I got my Cochlear Implant. Please click this link to the Amazon US website to download Ruby Tuesday by the Rolling Stones. Please click this link to the Amazon UK website to download Ruby Tuesday by the Rolling Stones. I met the artist while he was a contestant for 'The Voice' in Nashville. I was at Vanderbilt Cochlear Implant Research Centre. I felt inspired by his joy and passion for music and life! I shared with him that his YouTube song "Already Gone" was the first song I was able to hear lyrics to, in over ten years. He was so touched. Tears almost came to his eyes. I can understand his lyrics more than most artists on my journey to hearing music again. The simple guitar and vocals in this song are pleasant for me to listen to with my Cochlear Implant. The lyrics, to 'Long Gray Line' have an impact as they are a tribute to our service members and their sacrifices. 'Already Gone' is also an amazing song, but not as crystal clear, for me, because it has more instrumentation. Please click this link to the Amazon US website to download Long Gray Line by the Mitchell Lee. It is a sad, soulful song that brings tears to my eyes. Written by Eric Clapton after the death of his young son. I love hearing the soft instruments, almost church like to me. Please click this link to the Amazon US website to download Tears in Heaven by Eric Clapton. Please click this link to the Amazon UK website to download Tears in Heaven by Eric Clapton. The lyrics encapsulate experiences which are a reality for 'different' people. It's a great song and one of the most powerful that Linkin Park has released. Please click this link to the Amazon US website to download Iridescent by Linkin Park. Please click this link to the Amazon UK website to download Iridescent by Linkin Park. It's easy to follow her words and have a good sing along to. Please click this link to the Amazon US website to download New Rules by Dua Lupa. Please click this link to the Amazon UK website to download New Rules by Dua Lupa. My husband played this song for me. He calls me 'My Beautiful Cyborg.' So, it's a song that's fitting. The frequencies, and the quality of notes and sounds compiled in this piece are very crisp and clear to me. The song "tickles" and "scratches" my audiological pleasure spots. Please click this link to the Amazon US website to download The Robots by Kraftwerk. Please click this link to the Amazon UK website to download the Robots by Kraftwerk. This song has so many ups and downs and the melody is great. I love listening to it and jamming to the beat. Please click this link to the Amazon US website to download Time Bomb by Iration. Please click this link to the Amazon UK website to download Time Bomb by Iration. I have so many songs I would nominate but this one gets me singing and rocking every time. A few French lyrics throughout were a challenge to hear and learn, but for the most part I love the rickety sounds of the high percussion and top hat, the rollicking rhythm, the sense of timing and longing that James conveys in the lyrics, the begging vocals... everything about it speaks to me and makes me want to rock out in time. This song won out over 'Yellow and Rose' and 'Gaia' from the same album, 'Hourglass'. All great listening, for me. Please click this link to the Amazon US website to download Ananas by James Taylor. Please click this link to the Amazon UK website to download Ananas by James Taylor. For some of us that still have natural hearing then it’s important to ensure their protection with Earplugs. There are many brands on the market. Affordability: For a high-end product they are not overly expensive. These earplugs are also re-usable, which helps make the cost better value if you are a regular concert-goer, for example. Ear protection whilst maintaining sound quality: These earplugs preserve sound quality while attenuating noise up to 21 decibels (NRR 16 dB.) This means that noise is kept to a minimum, but you can still hear people talking and hear music with clarity. Music or voices won’t be muffled. Endorsements: They are trusted by major music festivals. Handiness: They have a handy carry case which goes on a keychain. You are less likely to forget them if they are attached to your keys. Size: Every order comes with the two shell sizes of ‘normal’ and ‘large.’ The likelihood is that they will fit the majority of ears. Should you have smaller ears, Eargasm also sell Smaller Ears Earplugs. 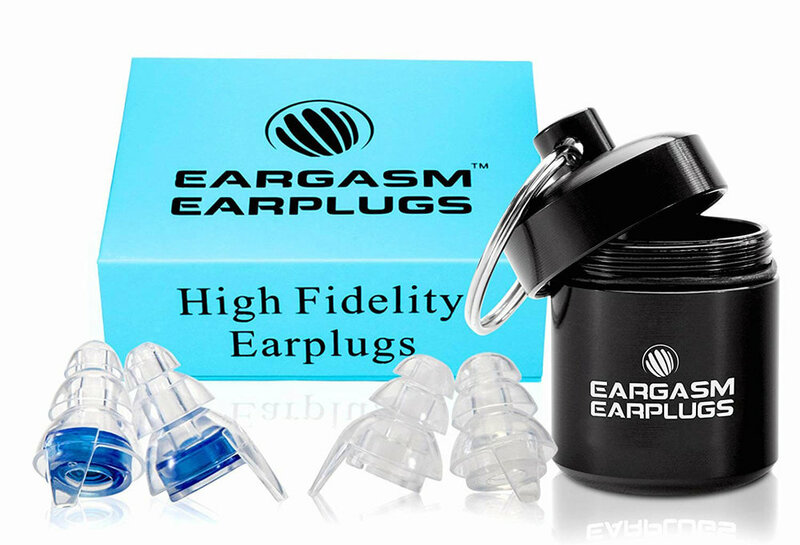 Link to Eargasm High Fidelity Earplugs. Travelling with a Cochlear Implant. Top 15 essentials.